Discover the industry standard for geopolitical simulation of today’s world! In Masters of the World, the third incarnation of Geopolitical Simulator, play as the head of state of one or more countries and expand your influence across the globe. The game engine, Geopolitical Simulator 3, includes over 600 data elements for each of the 175 playable countries and calculates their changes in real time throughout the game based on players’ actions. Some examples include popularity ratings, political relations, and economic exchanges between countries. 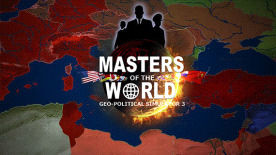 Various organizations, including NATO, use the technologies in the Masters of the World simulator for education and training. Over one thousand playable actions.At the country’s helm, the player/head of state can act in many areas: budget, taxation (nearly thirty types of taxes), currency, economy (over 130 economic activities), foreign and domestic affairs, defense, society, labor, health, social security, education, environment, transportation, culture, and more.